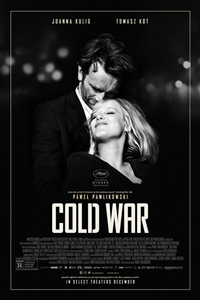 From its pristine black-and-white cinematography to the austere hopelessness of its doomed love story, Cold War is indeed cold. Set against the backdrop of Europe between 1949 and 1964, the movie details a romance as bleak as the surroundings. Filmed with a quiet intensity by Polish filmmaker Pawel Pawlikowski (who won an Oscar in 2015 for Ida and introduced the world to Emily Blunt in 2004's My Summer of Love), Cold War features a few too many ellipses and occasionally substitutes operatic tragedy for credible motivations. This results in a film that, although breathtaking to watch and emotionally wrenching, is strangely unsatisfying. It's as if by paring the production down to a sub-90 minute running time, Pawlikowski has robbed the viewer of key connective tissue that would have warmed the characters and their story. We first meet music director Wiktor (Tomasz Kot) and one of his singers, Zula (Joanna Kulig), deep in rural, post-war Poland. Like the world around them, they are still trying to find a sense of normalcy and, as they tour the country putting on a song-and-dance show that focuses on Polish folk music, they fall in love. Happiness doesn't last long, however. Wiktor, recognizing that his artistry will be compromised by the country's new Socialist masters (he is forced to incorporate a "patriotic" song into the show that is sung while a huge banner of Stalin is unfurled), escapes to Paris. Circumstances prevent Zula from accompanying him. For years, they are stranded on separate sides of the Iron Curtain until she contrives a way to join him in the City of Lights. The reunion is joyful but, with Pawlikowski determined not to dwell on moments of delight, things soon turn sour. It's said that love isn't enough and, in Wiktor and Zula's case, that's true enough. She becomes restless and their love nest starts to seem like a prison. She drinks too much, is unhappy with the record they make together, and wallows in misery. All it takes is one rash decision and they find themselves once again separated - a condition neither of them can endure. They cannot be happy together or apart. It's fair to argue that there's more truth in Cold War than in many love stories - that, although a romantic attachment isn't the best basis for a long-term relationship, its power cannot be denied or set aside. Pawlikowski used his parents' story as an inspiration for the screenplay and the movie is dedicated to them. That may be the warmest thing about Cold War, which makes the viewer feel the chill of the time, the place, and the inability of the characters to be in synch.